Her and Me and You is a very absorbing book, and Lauren Strasnick's style is both entrancing and slightly unsettling. Her short, yet extremely effective, prose is attention-grabbing and probing, and has an even balance between being descriptive and concise and to the point. There are a lot of parallels between Alex's relationship with the twins, the many relationships between various secondary characters, and her parents that won't go unnoticed, all of which illustrate an interesting message about romance and the nature of love. Fred and Adina are very interesting characters; eccentric, puzzling, yet they have a certain vulnerability that will intrigue the reader as much as it does Alex. While Strasnick's book may be one that some readers may leave feeling a little confused, it is a unique one that will have you musing after the final page. Cover Comments: I really like the colors and the depth of this cover...my only issue is: does anyone actually carry an umbrella when it's snowing? 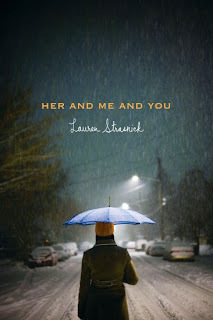 Lauren Strasnick is also the author Nothing Like You . Looks really good, I wanted to read it since I saw it. Great Review. Ah, I am SO excited for this one! I love love love the cover. I'm sort of intrigued by this book. :) And I love the cover, so... wintery! I've been hearing a lot of mixed reviews about this book which kind of makes me wary to buy it. In any case, if I do choose to buy it, I'll wait for the paperback!